Gentlemans Pistols’ intuitive fascination for fiery British blues has successfully sustained their career for more than a decade. Initially taking cue from early Black Sabbath and Judas Priest, the Leeds quartet strives to hone their craft to the fullest extent. Since forming in 2003, they’ve routinely set a four-year span between albums. Compared with the output of their peers, it seems like quite a stretch, but it is a testament to the loyalty of their fans. The band’s 2007 self-titled debut captured the rawness of classic garage rock—passionate, bash-it-out, rollicking fun. Following up with At Her Majesty’s Pleasure in 2011, they bounced back with tighter instrumentation and enhanced production values, along with a more noticeable vocal identity. 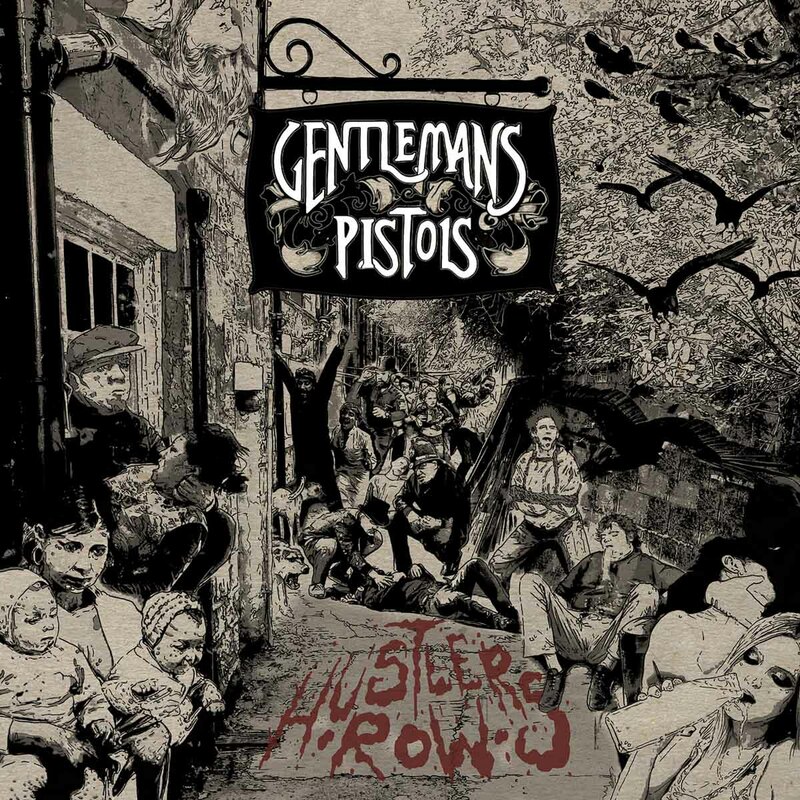 Now, much to the delight of fans, Gentlemans Pistols will release their latest album, Hustler’s Row, on October 16 of this year. Frontman James Atkinson takes care of production duties, further expanding the scope of experimentation and refinement. There is greater emphasis on vocal harmonies and “money” riffs, both of which are equally represented. But what this album has to offer, besides bolstering a new level of musicianship, is a dominance of personal subject matters that resonate on a sincere level. The album kicks off with its initial single, “The Searcher,” which succeeds instantly in grabbing the listener from the first note alone. The instrumentation, along with Atkinson’s vocal tone creates the milieu of taking a joyride and basking in the pleasantries of the open road. By stating “I’m just a little kid / Forgetting what I did / Can’t seem to find no direction,” the necessity for rebuilding his path is justified. The drums have a strong, up-tempo energy that is clearly matched by the fullness of the power chords. Bassist Rob Threapleton lays down a fluent bass bed and executes a varying groove without sounding too busy. I could go so far as to call this song a new generation’s “Born To Be Wild”, which is totally possible should it be pushed hard enough. While the first track deals with Atkinson’s impulsive pursuit of freedom, the second track, “Devil’s Advocate on Call,” further instates the reality of his actions. The lyrics suggest that he is under the influence of a personality conflict, acting as a clown, a bigot, and an egotist, all without showing remorse. I liked how the vocals are softer with bigger, almost detached harmonies, in order to effectively capture his weary attitude. The “Atko/Steer” twin lead very much reminds me of Rocka Rolla-era Glenn Tipton and K.K. Downing, and the riffs maintain a constant swagger that resounds all the way through. From this song onward, the journey to ultimate growth begins to take shape. In “Time Wasters,” Atkinson stops playing the enemy, having become newly aware of those who deterred him. As each phase progressed, I imagined him charging through zombified passersby. With every overwhelming cry of “Tell me just what can I do,” the breakdown portion of the song takes shape, first in a condensed form at around the 1:45 mark, and fully at 4:11. It proceeds to transition into a chugging riff, which elevates the unrelenting fury of the vocals. By the fifth track “Stress and Confusion,” the tempo slows down and Atkinson’s vocals are stripped of effects. I began to recognize the true extent of the band’s chemistry; even a phase that repeats has little nuances in it that keep it from stagnating. The way Atkinson pleads for his lover to stay with him regardless of her manipulation is spot on, and each verse allows the listener to capture a wide range of melodic nuances. There’s another notable breakdown with a soothing harmonies, which I felt should have lasted another measure. Nonetheless, the rhythm and lead guitar dynamic was exceptional once the song picked up tempo. “Dazzle Drizzler” exhibits similar stylistic components and stays with the theme of manipulation, but this track shifts the perspective from a saturnine futility to an empowering vigilance. At this point, Atkinson sees his exact experience with the roles reversed (a female being coerced by a male). He urges the victim to be cautious, and to not let superficial qualities—charm and wealth, in the song’s context—get the best of her. Each time the drum builds and dives into that giant riff, I have no choice but to crank of the volume. Atkinson’s singing peaks in intensity, and not only showcases impressive range, but genuine concern and care. The final track “Hustler’s Row,” depicts the eponymous location as a kind of last-ditch getaway from life’s tribulations. While the actual Hustler’s Row in Leeds is a serene street of lush greenery in proximity to Meanwood Park, it is portrayed on the album to be a dreary and inhospitable slum. In the album’s cover art, the people are sapped of color and life, the only instance of such being the street’s name scrawled in blood. However, the mostly mellow instrumentation and lyrics imply that the street still emits a humble aura, and that everyone, regardless of where they are from, is joined together in relative harmony. Overall, Hustler’s Row reassured me of the band’s ability to expand, and most importantly, deliver a kickass album worth waiting for. Just listening to Atkinson’s life experience is a reminder that in any point in our journey, we are presented with those same challenges that enable us to grow. We may still venture down the wrong path, be manipulated by the ones we love, and have to save our friends from danger, but in any event, we are worth it.